Clara Alcime has a strong background in real estate sales and property management. Prior to joining Coldwell Banker Lightbourn Realty, Clara was the top seller for a leading real estate developer in Nassau, selling homes and managing club membership in an exclusive oceanfront community. 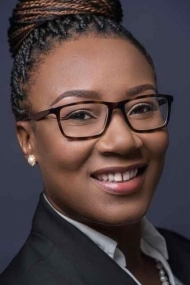 She has successfully closed real estate transactions for first time buyers, second homeowners and investors and is committed to ensuring that clients have an enjoyable experience while purchasing in the Bahamas. In addition to selling real estate, Clara has managed properties in Nassau and Abaco and has extensive experience in the vacation rental industry. Experience, an in-depth knowledge of the industry and a genuine commitment to helping others are her trademark. Clara holds a Master of Business Administration (MBA) from Arizona State University and a Bachelor of Science in Management from Barry University in Florida. In her spare time, Clara enjoys spending time with family and friends and traveling. Carla was promoted to the position of Marketing Manager in June, 2018.